When I first saw the title of this British import, I assumed it was about a moose who needed help fitting in, a book about social acceptance. And in many ways it is, but it's actually a lot more literal than that. 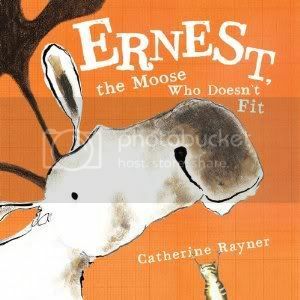 This is a normal sized picture book, but it is entirely too small for Ernest, who is a lot of moose to fit into one book. Graph paper background and oversized print surround Ernest and his small chipmunk friend. On each double-page spread, Ernest woefully tries to shimmy into the book, always with various portions of his body cropped out. The illustrations consist of fingerpainterly ink and paper collage. Their unusual solution is to "tape" together spare scraps of "paper" to create a large gatefold page at the end, where Ernest triumphiantly squeezes his whole body in. The way this book played with the idea of "bookness" and the way it broke the fourth wall and directly addressed the reader at times put me in mind of The Monster at the End of this Book, but it also reminded me of Art Spiegelman's Open Me, I'm a Dog, as well as The Book that Eats People by John Perry and Mark Fearing. When I was young, I loved books that ended with a fold-out page, they seemed so exotic and fun. What a treat! I know this will be popular with kids for that reason. As a librarian, I worry that the die-cut fold-out page at the end won't hold up well to heavy use... but I'll buy it anyway, because I know it will circulate. Share this with preschoolers and kindergarteners who are just beginning to really appreciate books. Oh, I loved loved loved THE MONSTER AT THE END OF THIS BOOK! And now I continue to love books which address the reader directly. If you don't yet know Mordacai Gerstein's A BOOK, it fits into this category beautifully. Thank you for introducing me to a great new title. A.
I just read Gerstein's A Book the other day! I liked it. What an unusual offering it is. I can't think of another book that has illustrations that are completely top-down. My four year old loved this book as was so sad when we returned it to the library!